This post has been sponsored Rubbermaid BRILLIANCE™. All thoughts and opinions are my own. 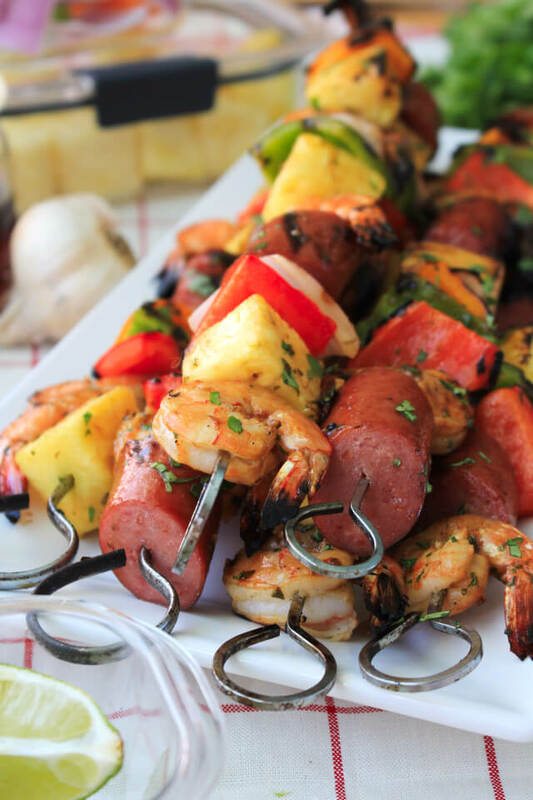 This Pineapple Shrimp and Kielbasa Kabobs recipe pairs tender marinated shrimp with lean turkey kielbasa and fresh vegetables for a colorful kabob that cooks on the grill in less than 10 minutes! Oh, kababs. How do I love thee? Let me count the ways. Seriously though, I could go on for days about how much I love kabobs! I mean, what's not to love? Just look at all of those beautiful colors lined up like a rainbow. Almost too pretty to eat if you ask me. Packed with lean meat and lots of fruit and veggies, these kabobs are truly a complete meal on a stick. So fun, so colorful, and super duper flavorful. 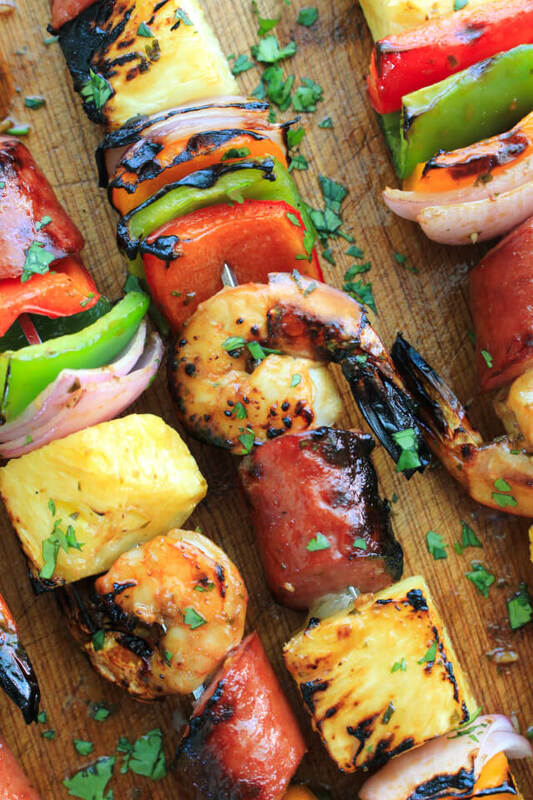 Kabobs are the whole package! 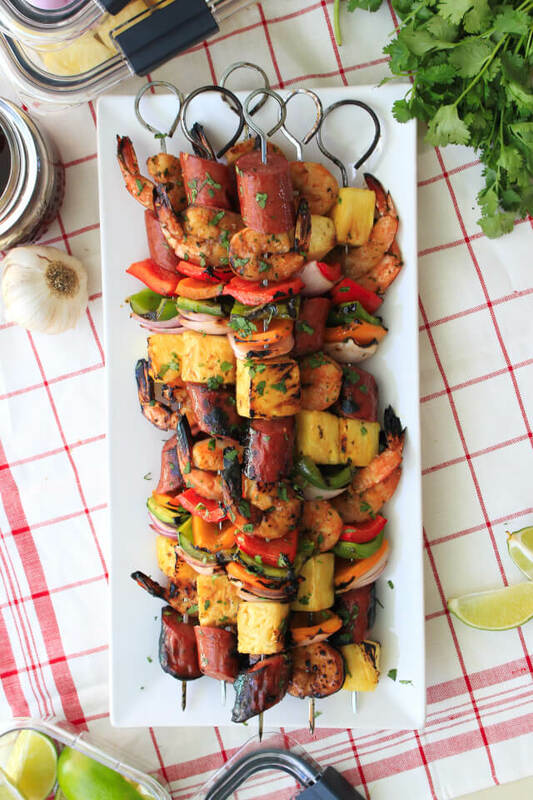 For this kabob recipe, I put a fun and summery twist on the typical beef or chicken kabob by swapping out the meat with tender shrimp and nice big hunks of turkey kielbasa, which my 4-year-old lovingly refers to as "the big hot dogs." I have been craving seafood like crazy and nothing says summer like some nice big shrimp cooking on the grill. I loaded these kabobs up with some Florida-fresh shrimp for momma and the big hot dogs (aka kielbasa) for the kiddos. And let's not forget all of that fresh pineapple, peppers, and onions. 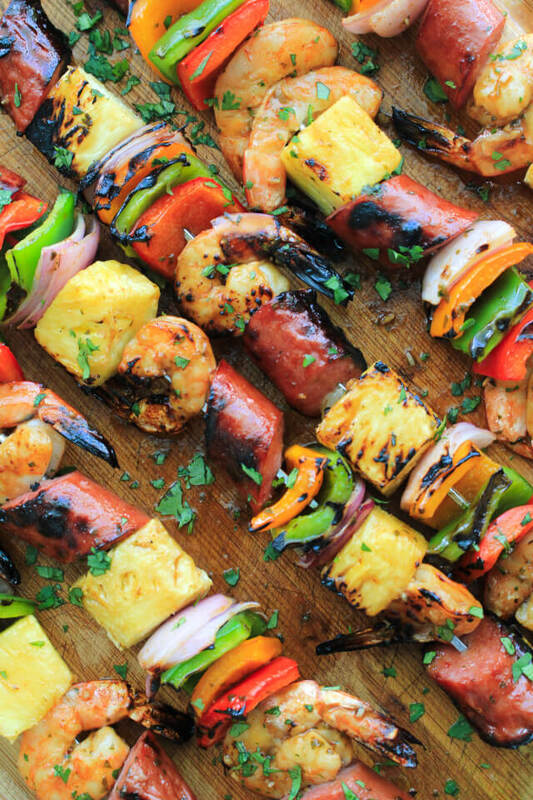 So many bright flavors packed into one stunning kabob! 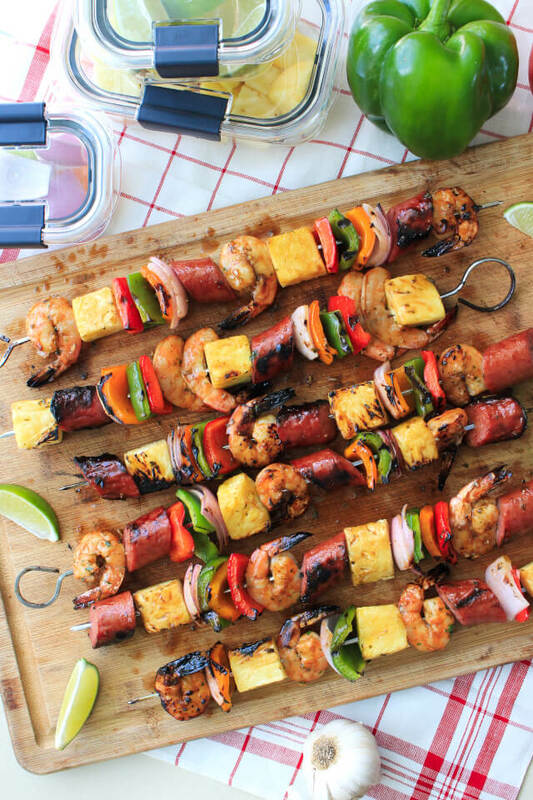 What really makes these kabobs pop is the simple marinade I used for the shrimp made with fresh lime juice, garlic, and sweet pineapple juice. 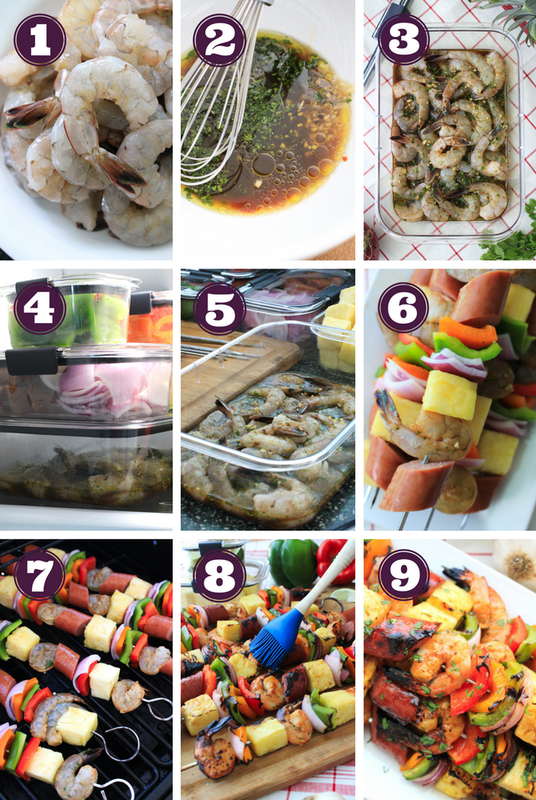 My new Rubbermaid BRILLIANCE™ containers that I picked up at Target were absolutely perfect for marinating the shrimp, not to mention keeping all of the other kabob goodies fresh and organized. Have you seen these awesome new containers yet? Normally they are located in the grocery section of your local Target, but for the entire month of July, you can find them displayed on the end-cap by the Kitchen and Homeware aisle. You've got to check them out! These Rubbermaid BRILLIANCE™ containers are seriously the best, intelligently crafted, beautifully designed storage containers that I have ever owned. No joke, they are that awesome. They are 100% leak-proof guaranteed, BPA-free, safe to use in the dishwasher, microwave, and freezer and have a full lifetime warranty. You know what that means? That means I'm going to be using these Rubbermaid BRILLIANCE™ containers for a long, long time. I went the make-ahead meal prep route for these kabobs, cutting up all of the pineapple and vegetables ahead of time, neatly storing everything in my fridge in my Rubbermaid BRILLIANCE™ containers. The containers stack perfectly and have crystal-clear lids and bases make it easy to see what’s inside, which is a must in my usually over-full fridge. Once the shrimp were done with their swim in the marinade, I lined all of the Rubbermaid BRILLIANCE™ containers up in an assembly line, making assembling the kabobs a breeze. 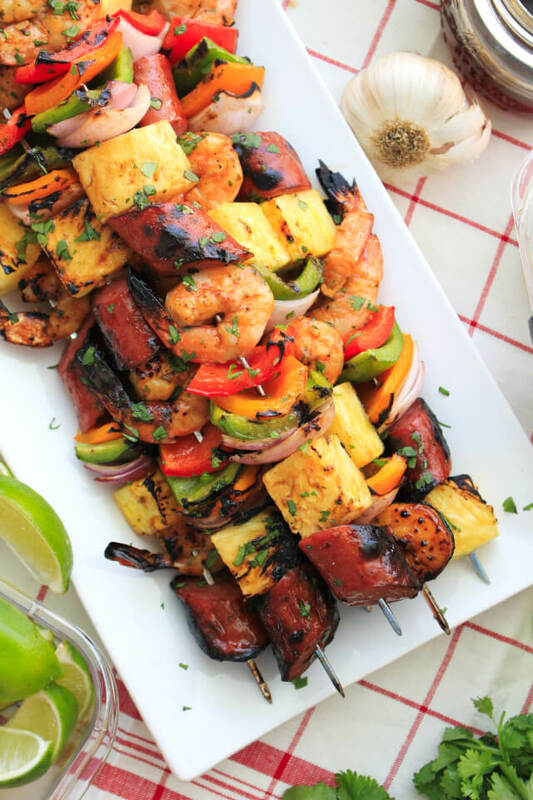 Depending on the size of your shrimp, peppers, and onions you may have just a few pieces of this or that leftover that don't fit on your skewers. If you have leftovers, just pop the lid back on your Rubbermaid BRILLIANCE™ container and use what's left to top a salad or slide into a wrap at a later time. Delish! After you've got everything skewered, all the kabobs need is less than 10 minutes to cook on the grill. So quick and easy. The kielbasa is fully cooked out of the package, so all you need is to get that shrimp cooked to tender perfection, which doesn't take long. I gave the marinade a quick boil on the stove and used it to glaze the kabobs once they were done on the grill, then I finished everything off with a garnish of my fave herb, cilantro. As I said before, these kabobs are a meal all by themselves, but you can always serve them with a light garden salad or a side of rice if you choose. I just know you are going to love these kabobs and the combination of bright, fresh flavors! I also know that you are going to love these Rubbermaid BRILLIANCE™ containers as much as I do. They are perfect for all of my summer grilling marinades, but also good for so many other uses. The fact that they have that airtight leak-proof seal means that filling one with some fruit salad and throwing it into my beach bag is totally doable. I can even send leftovers to work with my husband in one of these multi-use containers and he can easily reheat his meal right in the container with the lid on. All he has to do is unlatch the lid's latches before microwaving which will allow steam to escape from the built-in vents. They are splatter-proof, stain-resistant, and odor-proof. Win! If you have been looking for the perfect container to streamline all of your summer grilling and meal prep, make sure you check out these Rubbermaid BRILLIANCE™ containers at Target when you stop in to stock up on all of your favorite summer grilling and entertaining needs and Cartwheel deals! Lots of great Target Cartwheel deals coming up in August! If you try these kabobs or the containers, I'd love to know what you think. Let me know in the comments below. Happy summer grilling, friends! 1. Whisk together the pineapple juice, olive oil, soy sauce, lime juice, garlic, honey, and hot sauce. 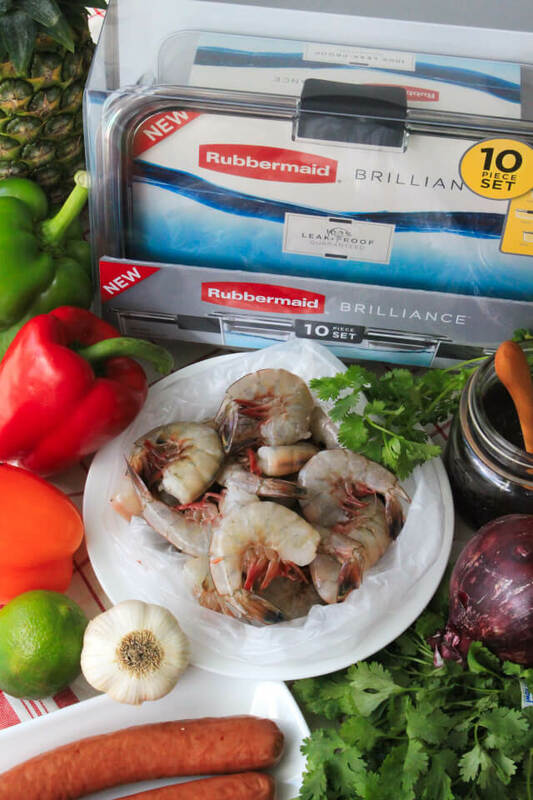 Place the shrimp into your large Rubbermaid BRILLIANCE™ container and pour the marinade over the shrimp. Place the lid on the container and refrigerate for at least 30 minutes. 2. 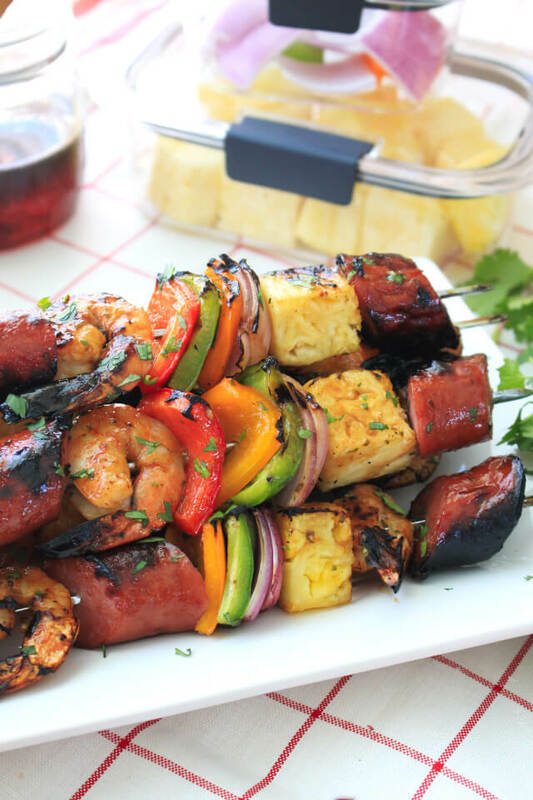 Thread the marinated shrimp, kielbasa, pineapple, bell peppers, and red onion onto the skewers, reserving the marinade. 3. Oil the grates of your grill and heat to medium-high. Grill the kabobs for 6-8 minutes, until shrimp is pink and opaque flipping once during the cook time. Remove the kabobs from the grill. 4. Boil the marinade for 3 minutes. Brush the boiled marinade onto the finished kabobs and garnish with additional minced cilantro, if desired. If using wooden skewers, soak the skewers in water for at least 30 minutes before using. To make preparing the kabobs a breeze, prepare the vegetables ahead of time and store in the fridge in your Rubbermaid BRILLIANCE™ containers until ready to assemble the kabobs.